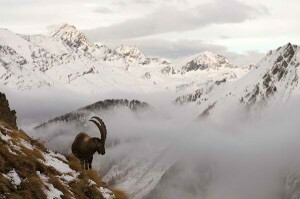 Alpine Ibex: Is it Close To Extinction? Have you seen a real Alpine Ibex? Or do you even know it? Alpine Ibex; (scientific name Capra Ibex) is actually related to goats. It is a species of wild goats that are usually found in the highest mountain of European Alps. Its color varies according to season changes but its natural color is somewhat dark brown with some grey hair all over the body. It’s the same cycle with its coat length, it varies according to season, and this is their way in adjusting and protecting their body from the season change. They have tall horns that can grow up to one meter which is their key weapon against their enemy or the predators. The most interesting feature of an Alpine Ibex is its ability to climb in even the most difficult and highest slopes. They surely have gifted feet to climb on. Alpine Ibex will it be extinct? Alpine Ibex is surely a rare animal. You can’t just find it anywhere as it can only be found in selective places. It mostly survives in Gran Paradiso massif (Valle d’Aosta region, Italy), which was reported that it was protected there and was conserved. It can also be found in countries like Switzerland, Italy, Austria, France, Slovenia and Germany. Unfortunately, the number of Alpine Ibex is decreasing due to some human population and the worse, “hunting”. In the recent generation, people are hooked in hunting animals. There are even organizations that pay to groups that hunt the rarest animals. 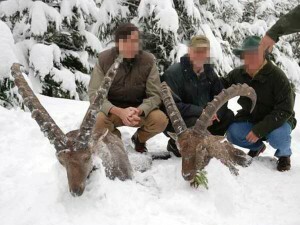 The pictures below will show you some people who poorly killed an Alpine Ibex (for hunting purposes). What’s sad about this is that, we are losing our special Earth creatures and some now are only found in pictures or in books. Alpine Ibex is not yet close to extinction. However, if hunting persists, time can only tell if we can still see them if the future. The Alpine Ibex has many different names, as it is called by local names in various languages. The Alpine Ibex is also called the French bouquetin, stambecco in Italy, steinbock in Geerman, and in Slovenian as kozorog. An excellent climber, the Alpine Ibex lives in the higher regions of the world. Its habitat is the rocky region of the snow line found higher past the European Alps’ alpine forests. The Alpine Ibex can manage the steep terrains and the rocky regions at high elevations. Growing up to about a height of a full meter, or about 3.3 feet from hoof to shoulder, the male Alpine Ibex weighs for about 220 lb, which is about 100 kilograms. The female Alpine Ibex grows for about half of that size. Males also have a prominent beard, which further distinguishes them from females. Backward curving horns are present in both male and female Alpine ibex. There is a slight increase in the size of horns for males, which can actually grow for up to about one meter. The Alpine ibex uses its horns to protect itself from predators like wolves, bears, foxes, and the lynx. Smaller and younger offspring are quite easy for eagles and other birds of prey to pick off, as they have no defenses for aerial attacks. Alpine ibex typically inhabit open, rocky habitats at high altitude, above the tree line at an altitude of 1,600-3,200 m. Steep, south-facing slops with rugged topography and grassy vegetation are preferred. Below the tree line, at subalpine levels, ibex are only found in open, sunny woodland interspersed with rocky outcrops. Living in montane pastures Ibex feed on alpine grasses, herbaceous plants and shrubs. This species is diurnal, but most active during the early morning and late afternoon. They migrate seasonally to different altitudes, spending the harsher winter months at medium elevations. Ibex are known to be extremely good climbers and do not fear steep slopes. The next series of photo’s show a group of ibex that are climbing up against Cingino Dam In the Italian Alps to eat the lichens from the stones and lick the saline that is disolving from the concreet.